All her life, Joy’s been haunted by a man she’s never met — her visionary grandfather, the artist Lorenzo. At work on digging a New York subway tunnel, his pickaxe struck the remains of an ancient Dutch trading ship — and a vision lit up the underground, convincing him that he was blessed. As it turned out, his children did well in life, and almost a century later, his granddaughter Joy, a gifted linguist, married the Canadian descendant of the lost ship’s captain. Yet nonno’s story also led to the death of Joy’s cousin Leonora, her Aunt Elena’s only child. It was a tragedy that might have been prevented by Joy’s father Eddie, a man who’s been bruised by life and who seldom speaks to his sister. Yet in the year 2000, he has no choice. Wealthy Aunt Elena and Uncle Carlo are coming from Rome to New York City to celebrate their fiftieth wedding anniversary. They’ve invited the family to dine at the sky-high restaurant in one of the Twin Towers — above the tunnel where nonno Lorenzo saw his vision long ago. On the first day of summer, Elena and Eddie will face each other at last. Midsummer is a story of family ties and fortune, and of finding peace as life nears its close, high above the historic place where nonno’s story began. 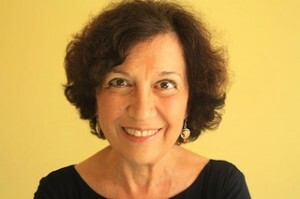 Born and raised in the New York City area, Carole Giangrande now resides in Toronto, Canada. Her novella, A Gardener On The Moon was co-winner of the 2010 Ken Klonsky Novella Contest, and is published by Quattro Books. She’s the author of two novels (An Ordinary Star and A Forest Burning), a short story collection (Missing Persons), all published by Cormorant, and two non-fiction books. 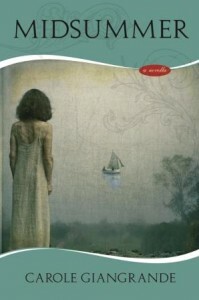 Her new novella, Midsummer, will be published in April 2014 by Inanna. She’s worked as a broadcast journalist for CBC Radio (Canada’s public broadcaster), and her fiction, articles and reviews have appeared in Canada’s major journals and newspapers. Her 50-part literary podcast Words to Go has been downloaded over 20,000 times in 30 countries. She comments as The Thoughtful Blogger, and she’s recently completed a novel. She’s a dual citizen of the United States and Canada. You know how, when you have a large family gathering, one where the assembled family spans the generations, and everyone knows a different piece of family history, so you’re never entirely certain where things begin and end and what the real truth of any story might be? That’s the feeling I got from reading Carole Giangrande’s novella Midsummer, and in that sense, it was a lot like coming home, spending time around the seemingly-huge round dining table in my Italian grandmother’s house, hearing family stories. But where my family is one ruled by drama and comedy, Giangrande’s story is a much calmer, more poetic look at family dynamics, and love and loss, and at the way history informs us. Told mostly in the first person voice of Joy, granddaughter of Lorenzo, a manual laborer who finds the remains of a Dutch sailing ship in old (old) Manhattan, we are treated, not just to her life and perceptions, but also to those of her Aunt Elena, keeper of the family stories, her sheltered cousin Leonora, her father, and her own family, Dutch-born Adrian, and their two sons. Because we were standing on an island, I imagined us gazing out over the sea, then turning to watch these two grey forms, their strange fragility of arches and latticework unmoored as they drifted upward, hovering over the city. Mesmerized, I began to wonder what was in the air down here, as all at once I stood inside the noon of midsummer, in an unknown June when the elegant towers would leave no shadow, would vanish into light. Lyrical, languid, brilliant, Midsummer is a fast read for a slow and sultry afternoon. I highly recommend it. Goes well with Caprese salad and iced tea.